East Haven, Connecticut - Monday, February 11, 2019: East Haven H.S. girls basketball vs. Mercy H.S. of Middletown Monday evening at East Haven. 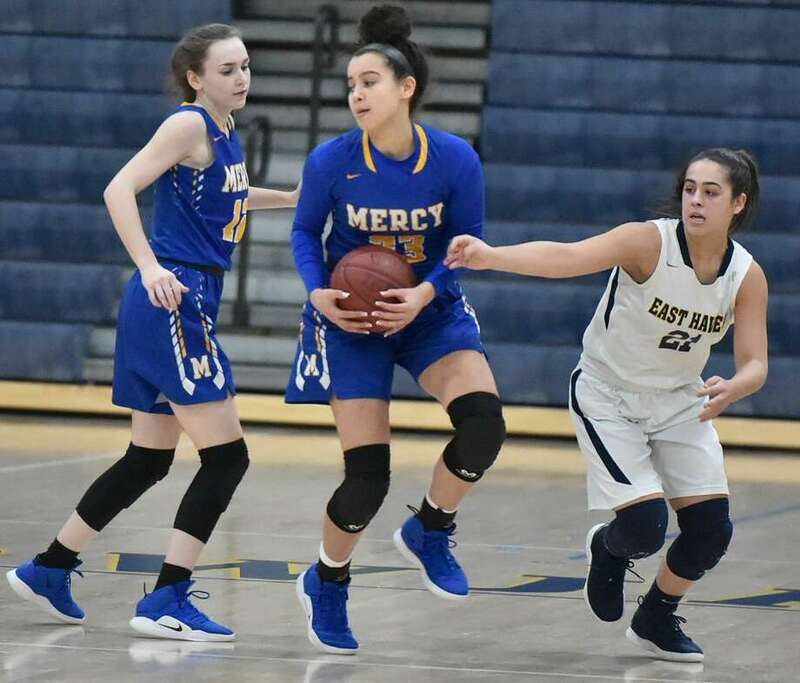 EAST HAVEN — Mercy senior Kameryn King knows converting free throws is not always an easy thing to do. King proved otherwise Monday evening. Converting on eight of 10 opportunities in the fourth quarter, King helped her team to its sixth straight victory with a 55-54 Southern Connecticut Conference interdivision decision over East Haven at East Haven High. King, who finished with a game-high 31 points, may have been right as East Haven mounted a furious comeback, rallying from 12 points down early in the fourth quarter to make it a two-possession game in the final minutes. Despite the loss, East Haven, ranked No. 5 in the GameTimeCT/Register top 10 poll still earned the top seed in the upcoming SCC tournament and will receive a first-round bye along with No. 2 Hamden. Mercy, which has won 13-straight league games and 13 of its last 14, earned the No. 4 seed. The Tigers are the two-time defending league champions. Ironically enough, The Yellowjackets rallied in this contest with leading scorer Makenzie Helms on the bench with foul trouble, then relied on her outside shooting to get within one possession late in the game. Helms, who finished with 21 points, drained a 3-pointer with 59.7 seconds to go to get the Yellowjackets within 48-45, then hit another trey 26.4 seconds later to get East Haven within 52-49. Helms finally got the Yellowjackets closer as her 3-pointer with three seconds to go had East Haven within 55-54, but time ran out on the comeback. In between the attempted heroics by Helms were the clutch free throws by King. King, who had given Mercy a 46-39 lead with a bucket with 2:55 to go, then went to the foul line four different times and knocked down 7 of 8 attempts in the final minute. Mercy (15-5) came out hitting on all cylinders, jumping out to an 11-4 lead in the opening quarter. Only a steal by Isabella Ragaini which led to an East Haven basket prevented Mercy from running away with the opening quarter, and kept the Yellowjackets in the contest. East Haven (16-4) got as close as 12-10 in the second quarter on a bucket by Alexis Pendziwater, but Mercy used a 3-pointer by Alexia Leon (12 points) and King, along with buckets by King and Leon, to take a 25-15 lead to the half. Erin Curran, who led East Haven’s comeback with a pair of 3-pointers in the third quarter and another in the fourth, had nine points for the Yellowjackets, while Taylor Salato finished with eight. Kameryn King — Mercy senior led all scorers with 31 points. King scored 10 points in the decisive fourth quarter, eight coming from the free throw line. Lexi Leon 4 2-2 12, Kameryn King 8 13-16 31, Sophia Finkeldey 2 0-0 4, Lilly Hedge 0 1-2 1, Vienna Knox 1 3-4 5, Rachael Cipolla 1 0-0 2. Totals: 16 19-24 55. Makenzie Helms 7 3-4 21, Erin Curran 3 0-1 9, Isabella Ragaini 1 2-4 4, Alexis Pendziwater 2 0-0 5, Taylor Salato 4 0-0 8, Alannah Doheny 1 0-0 2, Angelina Muñoz 1 3-4 5. Totals: 19 8-12 54.